Trade deadline? Schmed deadline. We already addressed that. Who cares, there’s a movie coming out! Cowboys vs. Aliens! Aren’t you ready for it? Seriously, whoever came up with the idea for this geekfest deserves both a Razzy and an Oscar for the same movie. I actually really want to see it. But if we’re genre-bending….why not? It could be a lot worse. They’re making ‘Battleship‘. I mean, how bad could it be? They made Clue into a woefully underrated film. Pirates of the Caribbean was great (well, at least the first one). I mean, Battleship? There really hasn’t been a well done naval movie in years, so the opening was there. And then they added the Aliens. Ignoring the fact that they placed this in the modern day, when all battleships have been decommissioned and mothballed. (The one you see in the trailer? Go see it, abandoned, in Suisan Bay. Seriously.) Aside from the ‘War Games’-theme the movie starts with. The best you could come up with is ‘Down Periscope‘ meets ‘ID4‘? Giants. Vs. 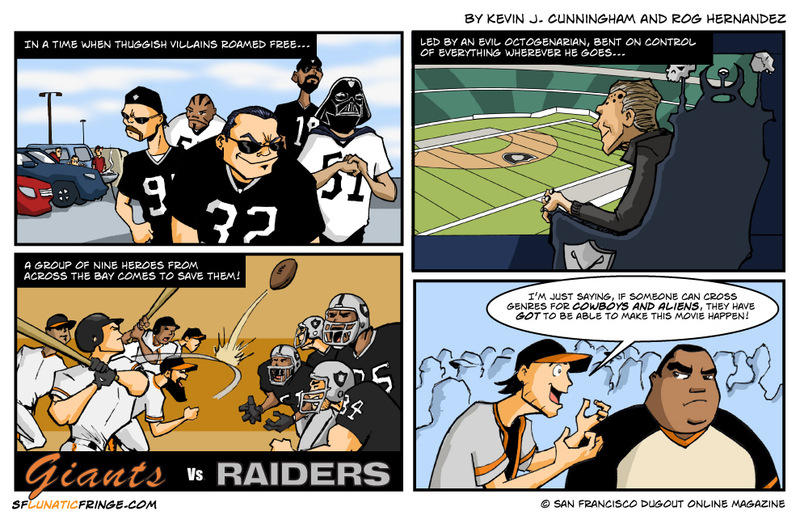 Raiders. Make it happen, Showtime. BTW, yes, it’s trade deadline time. We addressed it. The Giants made their big deal, and no one is going to outdo it. Go on, Charlie Manuel. Keep telling yourself “We can beat them. I know we can.” Seriously, that sounds like a line that can only be delivered under a shower head running cold water, and with lots and lots of running mascara and shame. Enjoy your weekend, everyone. And beware the Ivan Rodriguez’s jumping out of nowhere to get traded.